I have been plowing through books since I finished work for the summer. Admittedly, I’ve been struggling to stay on top of “new releases”, so the following recommendations may seem like old news to most of you. However, for those of you who are planning on curling up in a park or on the dock in the afternoon sunshine, make sure to take one of these exceptional books with you. 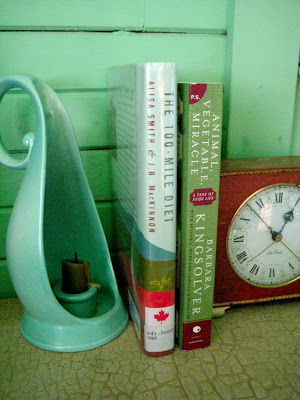 The first one is called The 100 Mile Diet, written by Alisa Smith and J.B. MacKinnon. This couple living out in Vancouver decided to abandon the conventional diet based on food that travels an average of 1,500 from farm to table, in favor of local foods that are produced within a 100-mile radius of their downtown apartment. Their journey is truly remarkable, filled with many failures and successes. I was amazed at how difficult this task was, and I could not help but be inspired by their commitment and unwavering dedication to their cause. Their experiment demonstrates how disconnected we are from our food, our environment and the problems that this separation causes. I fully agree with their message. I know that eating locally is an undertaking I find particularly daunting in our chilly climate, but one that I know would bring me far closer to my food community and deepen my appreciation of the environment (if that’s possible!). Eat food. Not too much. Mostly plants. I love it! 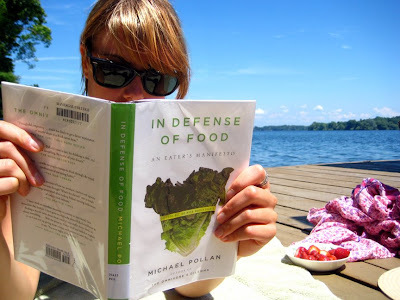 Pollan proposes how and why to get back to eating real food – not the processed edibles in pretty packages that seem to dominate North Americans’ dietary repertoire. This new (and very old) way of eating is informed by the traditions and ecology of our land and will only help to strengthen our health and the food chains of which we are part. There are even more simple rules that act almost as mantra in the final chapters. Some of my favorites are: Don’t eat anything your great grandmother wouldn’t recognize as food. Get out of the supermarket whenever possible. Pay more, eat less. Eat slowly. Do all your eating at a table (no, your desk is not a table). And my personal favorite (this one goes out to my dad…) Don’t get your fuel from the same place your car does. Barbara Kingsolver’s latest book, Animal, Vegetable, Miracle is a work of non-fiction that I actually purchased, as I am such a fan of hers, I couldn’t resist the idea of her writing about my favorite subject. After about 10 pages I could not put this extraordinary story down. Her descriptions of food and farming and eating are hauntingly beautiful, and she tactfully weaves factual elements into this lyrical account of how her family chose to eat local foods for one year, not unlike Smith and MacKinnon. It’s totally addictive. All three of these books are page-turners in their own right. Although they are not the juicy novels that most of us endeavor to devour when we have a little extra time on our plates, I assure you that they all teach and inspire about the one thing that we all have in common.